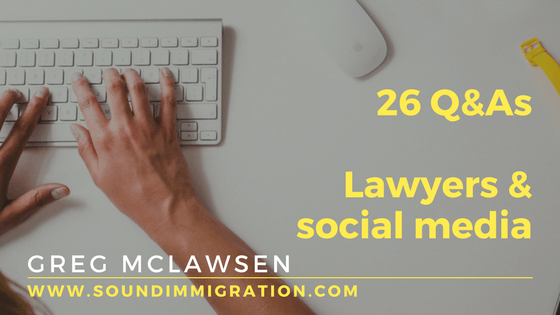 Social media for lawyers - 26 questions and answers — Puget Sound Legal, P.C. Thanks to the 1,372 lawyers who attended this week's social media ethics Legal Lunchbox talk. We understand it was the largest program ever hosted by the Washington State Bar Association, which speaks to the interest and angst that many of us share about the role of social media in our profession. Thanks to Jeanne Marie Clavere and Sumeer Singla for carrying the panel. As promised, this post provides my own feedback to the many audience questions that we weren't able to address during the presentation. I'm including questions that went to Dan Dawsey, who gave the marketing/business development talk that proceeded the ethics portion of the presentation. I've excluded questions that were too context-dependent to make sense here. (Personal opinion only, here). I experimented with LinkedIn Premium and found it didn't serve any advantage. It seems the best fit for sales professionals who want to spend time actively identifying and "reaching out to" prospects. Basically, Premium offers features to make those initial contacts easier. (My wife says "reaching out" sounds creepy). For me, the primary reasons to use LinkedIn are to (1) provide an accessible profile for folks searching my name, and (2) as one means to stay in touch with my network and see what's going on with folks I'm interested in. Nope. If you know that Facebook - or any social platform - isn't something you're interested in, take a pass. In 30 minutes/week you could easily maintain an active, if not super engaged, Facebook page for your business. That might be worth it for purpose of those who will vet you through the platform. But if you're not deeply interested in engaging with your audience there, I wouldn't expect it to be a big source of new business. I'm not a big Facebook user myself, and use it more to maintain a window into what's going on at the firm. 3. Is it a good idea to niche though v. pigeonhole? As a friend said, "niches make riches." Meaning, don't say you do everything on your social media presence, but narrow. This worthy question came from WSBA President, Robin Haynes, who is probably one of the most social media-savvy lawyers in the state/country. For an excellent example of a Facebook business page, check out hers right here. That phrase usually applies to one's choice of practice area. But it's fair to apply it to social media as well. Most gurus advise identifying the one or two platforms that are most suited to your strategic objectives, then focusing on them. The crux of social media is to be, well, social. Just like it's hard to be active in every social club in town, you're not going to successfully engage on 12 different online platforms (unless you're ready to invest some real resources). (Credit goes to NW legal blogging legend, Kevin O'Keefe for popularizing the phrase "niches lead to riches" in this post). The panel would have addressed this directly if we'd made it through all the slides. Attorneys have an affirmative responsibility to ensure that all their marketing communications are not misleading. That covers reviews on profiles over which we have control. A quid pro quo arrangement, where A agrees to provide a positive review for B in exchange for the same, could certainly be misleading. A reader would justifiably expect that a review was based on, well, something real. On the other hand, there may not be anything problematic about giving a positive review to another attorney, then asking them if they would be willing to offer an honest review on your own profile. If you don't know them well enough to anticipate what they will say, that's telling. As Jeanne Marie puts it: "there may not be anything problematic about giving a positive review to another attorney, then asking them if they would be willing to offer an honest review on your own profile as long as it was based on everyone’s real experiences." You're in luck: personal and business Facebook pages are different creatures. Technically, people have profiles, and businesses have pages. But yes, you can create a page for your business, separate from your personal profile. Virtually every major brand in the U.S. has a Facebook presence. So do all major firms, like Perkins. I'd suggest that Facebook is so major that in fact, it's the opposite: you risk being seen as unprofessional and not well-established if you don't have a Facebook presence. Cool question. In terms of niche, the more niched the better in terms of social media and all other marketing. The more focused your market is, the easier it is to provide relevant content. I don't know your market well enough to offer a specific opinion. But I would still think there would be an opportunity to provide timely content to the decision makers you care most about. But that might end up looking less like a Facebook presence and more like a tightly tailored email newsletter. 9. Does anyone have a well-researched disclaimer/warning concerning responses to people's posts not creating an attorney/client relationship? And is there a preferred location (or locations) to put such a disclaimer? I don't believe any Magic Language disclaimer/warning will automatically save you. Instead, we have to pay attention to the content of our communication with prospective clients. If I tell an Avvo user, "meh, there's no such thing as a statute of limitations," I wouldn't expect a waiver to save me. Instead, I propose avoiding individualized (application of law to your facts) advice. 10. What are the best ways to get more engagement/higher reach? Our practice isn't the most exciting and often times doesn't come off very interesting unless needed. Do you have any recommendations on trying to reach out to more people and be more humanizing? I don't know if I believe that there are any unexciting practice areas. Even the driest legal work is solving a "pain point" that's important to someone. What's the story about the pain you're alleviating, or goal that's being accomplished? I often hear from my savvier peers that lawyers focus too much on their work (which is, indeed, often boring to the public) and not enough on the client, and what's important to them. So I'd look for the excitement, or at least interest, from the client's side. A good place to start for insight on engagement, etc., generally is Samantha Collier's Social Media for Lawyers blog. For most of my folks in the small practice, TV is *way* outside their marketing budget. There's unlikely to be any answer to this that is true across all practice areas and market segments. But if there's any single answer, it has to be social media, since you can get at least some bang at a price point (or resource investment) that would produce zero bang with TV ads (since you wouldn't be able to get one launched). Not unless you have that client's implied or express consent. The fact that you represent the client is a matter "relating to the representation" and covered by RPC 1.6. Unless the client okays it, you can't disclose the fact you are representing him/her/it. 13. If I saw [a clause about communicating the results of a representatoin] included in an agreement with a lawyer I'd run out of the office and find a different lawyer. This comment was made in response my idea that a services agreement could give permission to report the results of a representation, with personal information redacted. That is, the firm could say, we won $x in y type of case, without mentioning the client's name or identifying information. First, some firms must be doing some form of this since lots of (e.g.) personal injury firms advertise case outcomes. Second, maybe not every prospective client would be alright with it. That's okay. If the marketing value of the information is real, maybe it's worth having conversations with prospective clients who are worried about the terms, and modifying or striking the language where it creates a problem for the client. This was also in response to the idea (directly above) about a legal services agreement. The other presenters were skeptical about my idea. I believe their concerns were that the changing nature of a legal representation could make it hard for a client to judge at the outset the fairness of a disclosure clause. It's not clear to me if that would be an RPC issue, or relating to the law of lawyering, which imposes additional restrictions on legal services contracts. 15. How should lawyers handle disclosure of case results when published by Google, Avvco [sic], etc.. without the lawyer's reviewor [sic] any apparent way to know it's there or remove it. Is this anything a lawyer needs to worry about ethically? A lawyer doesn't have any ethical duty to police the internets for incorrect (or correct) reports about cases in which the lawyer is involved. By contrast - and this might be the point of confusion - an attorney *does* have to monitor statements made on social media profiles over which the lawyer has control (such as LinkedIn, or endorsements on Avvo). If the client has consented to the disclosure, you could disclose the name to anyone. If I'm missing the question please jump into the comment section below. I am very disappointed to learn of this individual's experience. Legal ethics prevent me from disclosing facts that relate to my work with this individual as her attorney. The individual's experience is not representative of the overwhelmingly positive experience of my clients, as shown on this page. The general advice in these scenarios is to respond - generally, briefly - to acknowledge the negative review. Then the most helpful step is a spin on the First Amendment adage that the solution for bad speech is more speech. The way to mitigate the impact of a negative review is to flood the particular site with positive reviews. So double-down on your efforts to ask all former and current clients for their input. I don't see that this would necessarily be problematic from an RPC standpoint, though it could in terms of "law of lawyering." That is, I'm not sure such a clause would be enforceable, but I don't see that it would be clearly unethical. 20. Please briefly describe the scope of a "lead generation service." Some of us are not familiar with this marketing sector. Lucky you! "Lead" is sales talk for someone who might be interested in whatever you're selling - here, legal services. There are a bunch of businesses that will sell you X number of leads for a set price. Typically these services will have websites setup to attract visitors who are interested in, say, a DUI attorney in Seattle. They'll collect information through, for example, web forms, and then sell that information to lawyers as a "lead" who is interested in a Seattle DUI lawyer. My experience with most lead gen services has been terrible. Certainly, I wouldn't count Super Lawyers as a social media platform. In my young(er) years as a lawyer I set a goal to get listed as a Super Lawyer for Consumer Immigration. It's very hard to judge the impact that's had on business, though it's hard to imagine that it hurt. But I haven't paid for any advertising with Super Lawyers. Your boundary here is RPC 7.4, especially 7.4(d) (prohibiting advertising one's self as an expert). Avvo's former GC, Josh King has written a lot about the tension between the 7-series RPCs and the first amendment. The RPCs safeguard consumers by prohibiting over-blown claims by attorneys, but at the expense of some expression that seems pretty unproblematic. For example, there's a practice area where - as far as I know - I'm really the only attorney in the country who focuses on it, and I've written more than anyone else. But yet I run afoul of RPC 7.4 if I call myself an expert? I am an expert*! (*Greg is not declaring himself an expert). But who wants to be the test case? I would steer clear of the sort of puffery that we all know from 1L year is fine for other businesses. 23. With respect to referrals, why isn't it unethical to have any arrangement where you make a referral where personal gain is a consideration in any way? When a client or prospective client asks for a referral, shouldn't the only consideration be what is best for the client? If you gain anything, isn't that an improper consideration? If you're saying that course of conduct is unethical, seems the burden should be on you to explain why. But here, I'll do the work for you. RPC 7.2(b) gives us the clear rule that: "A lawyer shall not give anything of value to a person for recommending the lawyer's services [...]." So whether it's a Bengamin or a Bolonger, Lawyer B can't give it to me for recommending her expert services. Nope. If it can't win you a presidential election it certainly won't win you any clients. It's ethical for you to ask your happy clients to leave reviews, and to perhaps not mention the idea to others. But coaching the individual on the content could be seen as directing a misleading communication about your service. See RPC 7.1. At the close of the presentation, I mentioned "net promoter score." The idea is to identify which of your clients are likely to recommend you to a friend or family members. There are fun tools - I use Get Five Stars - that allow you to ask your clients to rate your performance privately. If the client gives you a good rating, then they're asked to write a public review. So you're using the tool to screen and collect good reviews from your biggest fans. Thanks again for everyone's engagement with these issues. Please feel free to jump in below with more questions/comments.